Konstant’s Foods is three different Lexington Market destinations located in close proximity, all of them famous. Outside you’ve got Konstant’s Peanuts, the longtime purveyor of old-time snack food, that is as satisfying today as it was 100 years ago. 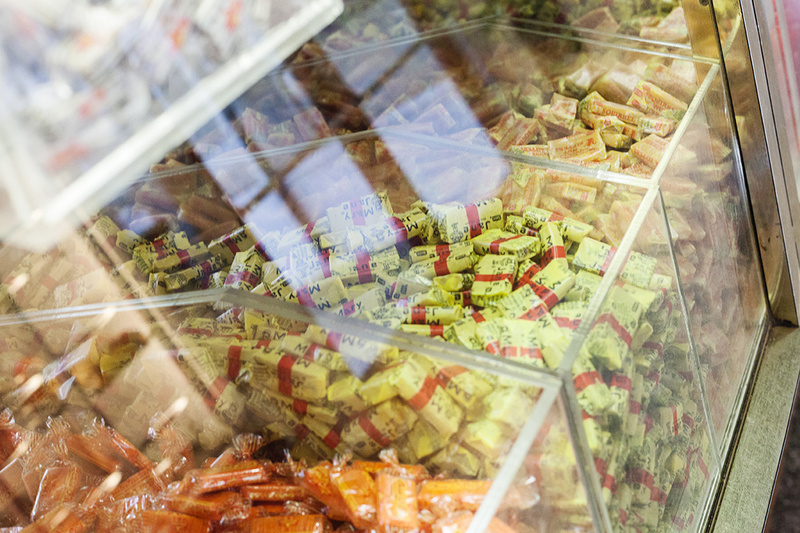 Inside, there’s Konstant’s Candies, and its neighboring location selling hot dogs, barbecue, and other legendary game-day treats. Konstant’s is about the simple pleasures of life, done about as well as they can be done. That’s why the fudge is made in-house and the peanuts are prepared in a roaster that was built during Teddy Roosevelt’s Presidency. Larry Brenner is the man in charge these days, and he’s clearly the one for the job. During our brief interview, he manages to clean, prepare food, joke with a dozen regulars, and give orders to employees, all while answering my questions with characteristic good humor. “I’ve been here 7 years,” says Larry. “We’ve been here 119 years.” That’s a lineage that stretches further back than nearly any other Lexington Market institution. It’s a history Larry wants to leverage to bring the Market back to its glory days, the ones that were fading when he started his tenure. Many of Konstant’s employees have been around much longer than their employer. Of the 13 full time workers, several have been on the job for 20 to 25 years. That’s a living history that Larry and his co-operator son respect. It’s why he hasn’t messed with the elements that have made Konstant’s great. When the old peanut roaster broke, he had new parts machined for it and paid for the whole machine to be rebuilt. When Lexington Market struggled through the Recession, he just kept making homemade soups, chili, ribs, barbecue, and (always) fresh roasted peanuts. It’s a determination that has enabled Lexington Market itself to survive for generations. After the original location burned to the ground in ‘54, today’s location was debuted in ‘56. Many of the Konstant customers I spoke to have a family attachment that stretches back that long or even farther, grandparents bringing their grandchildren, who grow up and bring their own children and grandchildren. One man I spoke to says he feels like his day is incomplete without a walk to Konstant’s for his favorite: a plain hotdog on a bun. It’s the simple things, and that’s what Konstant’s does best. But even though they’re one of Lexington Market’s most famous institutions, Larry won’t hesitate to say that there’s work to be done. Larry remembers the dark days of recent years, and extols the new management decisions which are reinvigorating his beloved market. As Lexington gradually expands its hours to include evenings and Sundays, Larry anticipates big opportunities to sell to fans on their way to games at Camden Yards. His perspective is helpful when considering Lexington Market, or Baltimore at large. It’s an attempt to elevate standards, while continuing to serve patrons with graciousness and excellence. It’s a demonstration of how hard work and empathy can improve a great market, and a great city. Today, the future looks bright. But whatever the next years hold, you can be sure that Konstant’s will be open for business, serving up simple pleasures to whoever wants them.